As I've said before, one of the things I love about cooking is the chance to experiment. You can experiment with new flavour combos, new ingredients, new methods, and just generally try out anything your mad scientist brain comes up with, and the mad scientist approach is fine if you're going for over-the-top combinations. But often other discoveries are far more subtle and are sometimes a matter of taking little risks with ingredients and getting startlingly good results. One case is finding a new ingredient that brings out unique flavour combinations. Another is pairing ingredients that you wouldn't think work well together, but somehow do. There's also trying a few new and unexpected, but reliable, twists on an old classic and yielding results that go far beyond your expectations. So here's the scenario: it was an average winter's night and my girlfriend and I had decided to go with a comforting "chicken, potatoes and vegetable" trio for dinner. Now, I was out shopping for dinner supplies, when I happened upon a new ingredient that really got a ball rolling in my head. It was at La Bottega Nicastro and they were selling something called 'Nduja. 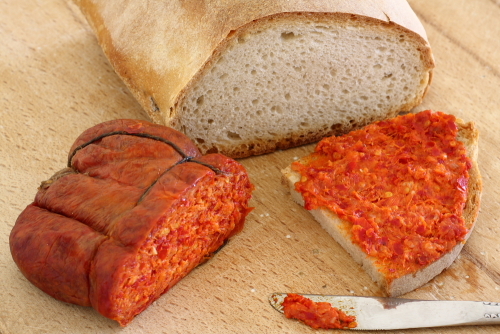 'Nduja is a spicy spreadable salami. It has the flavours of a hot Soppressata salami, but is soft, almost like using sausage meat. I looked it up online and it turns out its origin is that it was a kind of an Italian take on Andouille sausage, a classic smoked French sausage, most often seen in Cajun cooking. However, 'Nduja and Andouille taste completely different; Andouille is smoky and full of herbs, 'Nduja is fiery and tangy. ﻿ Anyway, now that I had my weird salami to play with (wait, that sounds wrong...), I decided I was going to make a stuffed chicken breast, mixing the 'Nduja with some bocconcini and black pepper as the stuffing, coating the chicken in in bread crumbs and baking it all. The end result surprised me in that it looked very much like a sort of reverse version of an old classic with a lovely little twist on its flavours, but still tasting somewhat familiar. What am I talking about? Well, with its vibrant red colour, the 'Nduja stuffing looked a lot like (and surprisingly tasted like) the tomato-parmesan sauce/coasting we find on Chicken Parmesan. So that brings us to our first recipe. - Carefully cut a slit along the side of the chicken breast, creating a pocket for the stuffing. - In a bowl, mix together 'Nduja, bocconcini and black pepper with a fork. You'll have to mash the mixture somewhat forcefully to really soften up the cheese, so use a sturdy fork. As with anything, feel free to add some other spices or herbs to the stuffing; I would bet that some fresh basil would be nice. I don't recommend adding salt as the 'Nduja is pretty darn salty as is. - Stuff each chicken breast with half the 'Nduja mixture. - Coat each breast with egg and dredge in breadcrumbs until fully covered. (I forgot the egg part when I first made this, hence why in the picture, the chicken looks kinda naked). - In a baking dish or on a baking sheet, place chicken in oven and bake for about 20 minutes, until coating is golden, stuffing is bubbly and chicken is cooked through. - Serve hot with broccoli and potatoes (recipes to follow). Next on our adventure in flavour discovery we have what I'd like to call 'unlikely pairings' in the flavour department. Think about food combos that you would never think to put together but when tried, they're awesome! Chocolate and bacon is a good example; you wouldn't think they go together, but we all know now that they work wonderfully together! Just ask Homer Simpson! There's also blueberries and blue cheese (Kari gave me that one), not to mention peanut butter and Sriracha (easy Satay!). I had a friend who refused to eat fruit and meat together because she just couldn't get her head around the concept. Too bad she had to miss out on Bacon-Wrapped Peaches! But I'm sure she isn't alone in her aversion to 'odd' food combos. OK, so clearly bacon goes with everything. But broccoli, on the other hand, doesn't really go with a whole lot of other flavours; cheese sauce, beer, slivered almonds, there really isn't a whole lot, is there? And yet, with a the simple decision to add toasted pecans to a side dish of steamed broccoli and sauté the lot, culinary history was made. Well at least, it was made in my kitchen! As I was tossing in the pecans, I kept thinking this NEEDS something... What goes with broccoli that also goes with pecans? Now, I drew a blank when thinking of pairing something with broccoli, but I then thought about pecans and praline and what flavours praline and then, SKA-BOW!!!! It hit me! VANILLA!!!!! Now, I know what you're thinking, Dude, vanilla? As if! I'm outta here... But I kid you not, it works! It works BEAUTIFULLY! What's the worst part about broccoli? The bitterness, right? Well, really good vanilla extract (or vanilla bean I suppose) does a wonderful job of getting through the bitterness and adds an unexpected sweetness that broccoli has been missing for a long, long time. Of course, an added touch of butter helped it all come together as well. -Toast pecans in a frying pan on medium-high heat or in the oven (which is hopefully already on and cooking chicken!). Be careful to ensure they don't burn! Set aside once toasted. - Fill a pot with about half an inch/one centimetre of water and set to boil. - Once water is boiling, steam broccoli for two or three minutes, until it's a vivid green. - Strain broccoli in a colander and rinse with cold water. Set broccoli aside until chicken is nearly done. - Once ready to serve, set a frying pan on medium-high heat and melt butter. - Sauté broccoli and pecans in butter for a minute or two. - Drizzle vanilla over top and continue cooking for another minute. Serve hot. If broccoli and vanilla qualifies as our "never would have expected it to be good but it is" entry, our next exploration is along the lines of "why have I never tried this before?!?!?" It's amazing how we get caught up in the idea that the 'old favourites' have to follow a simple flavour profile. But they don't have to! Who says Shepherd's Pie have to be the same old boring beef, potatoes and corn? I don't! And then there's our old friend Mashed Potatoes. Potatoes, milk and butter... whee... And yet we all have grown to be so comforted by our traditional flavour combos that we rarely think to get creative with these foodstuffs. Well, luckily most of us have a fridge and pantry full of flavours to raid. Now, think of potatoes and what might accentuate the flavour of your old school mash. Maybe some chili powder? Maybe some dried and powdered mushrooms? Bacon (duh)? That's what's great about potatoes: they're like a blank canvass for cooking. In this case, my own thoughts were of light and fresh and bold. So, I was hit with the inspiration of using lemon juice and rosemary in the mash. And then my inner hedonist added blue cheese... that jerk! - Set a pot of water to boil. Once boiling, add potatoes and boil for about 10-15 minutes, until potatoes are tender (if they can be easily pierced with a fork, they're ready). - Drain potatoes in a strainer and return to empty pot. - Stir in milk, butter, rosemary, lemon, salt and pepper. - Mash roughly with a potato masher of sturdy fork. I like a rough texture (hence 'smashed' instead of mashed). If you really want a smoother texture, keep mashing until smooth. This might make the tougher texture of the rosemary stand out too much though. A plate full of discoveries! - "Reverse Chicken Parmesan" (Chicken stuffed with 'Nduja and Bocconcini), Broccoli with Vanilla and Toasted Pecans, and Smashed Potatoes with Lemon, Rosemary and Blue Cheese. And there you have it! An entire meal full of surprises and none of which are terribly difficult to put together. I hope you enjoy one or all of these dishes in the near future. ... while I get that you added blue cheese to the potatoes, you didn't include it in the recipe..d'oh! Clearly I need an editor. Will update right away!